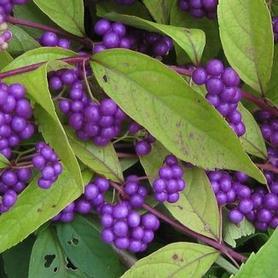 'Early Amethyst' Beautyberry abounds with large quantities of small lilac fruits in the fall. Originally from Brookside Gardens in Maryland. This is the same plant as C. 'Issai', per Barry Yinger. 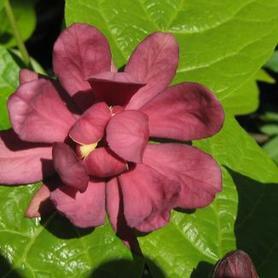 Calycanthus floridus has dark maroon flowers in May and June that are often fragrant. Fall color is yellow. 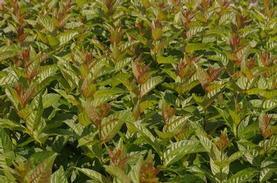 Sweetshrub is wet site tolerant, as well as dry shade tolerant. Calycanthus is distantly related to Magnolias. 'Athens' ('Katherine') Sweetshrub has yellow flowers in May and June that are consistently fragrant. A great introduction from Dr. Michael Dirr in Athens, Georgia; it was named after his daughter Katherine. It is wet site tolerant. 'Edith Wilder' Sweetshrub is a lovely selection of this adaptable native plant, first appearing at the Scott Arboretum of Swarthmore, PA. The reddish maroon flowers are strongly and consistently fragrant, and are displayed profusely on the upright branches. The foliage is rounder than many of the other forms, and is held at right angles to the stems. Fall color is a good clear yellow. Wet site and dry site tolerant, deer resistant and native, what more could you ask? 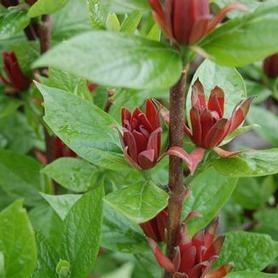 'Michael Lindsey' Sweetshrub has reddish brown flowers that are consistently, gorgeously fragrant, blooming for a prolonged period in April and May over dark, lustrous green foliage. Fall color of Calycanthus floridus 'Michael Lindsey' is a clear yellow. Selected by Allen Bush of Holbrook Farm & Nursery in North Carolina. It is also wet site tolerant. Extremely verticillium resistant per Rick Darke. 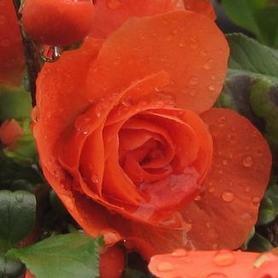 PRN Preferred: Heavy bloomer, fragrant flowers, lustrous foliage with good fall color. Reblooms sporadically throughout the summer. 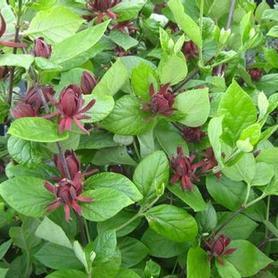 'Burgundy Spice' Sweetshrub represents a radical color change in Calycanthus foliage, with lustrous deep burgundy leaves throughout the summer. Richard Hesselein and Daryl Kobesky selected for darker foliage over a number of years, coming up with 2 beautiful purple colored sports. 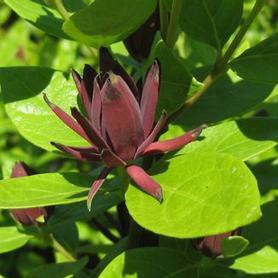 We chose the best one to name Calycanthus floridus var purpureus 'Burgundy Spice'. The maroon flowers appear in May and June, and have the classic mango and pineapple fragrance of good Sweetshrub selections. The fall foliage adds another season of enjoyment, turning attractive shades of yellow and amber. PRN Preferred: The deep burgundy foliage remains all summer, does not fade or bleach out in the sun. 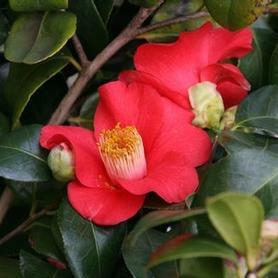 Camellia japonica 'Greensboro Red' has semi-double, trumpet-shaped light red flowers on an upright plant in April and May. The original plant came from England in the early 1800's and was such a favorite in Greensboro, NC, that it was named the 'City Flower'. 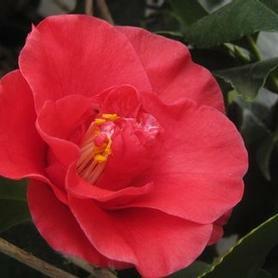 'Greensboro Red' Camellia is evergreen and a spring bloomer. Camellia seed was given to William Flemer III by Dr. John L. Creech of the National Arboretum, who found it in the northernmost reaches of the island of Hokkaido, Japan. From the resulting seedlings, Richard Hesselein picked out 'Hokkaido Red' as the most promising selection. Its extreme tolerance of cold combines with its plentiful production of bright red trumpet-shaped single flowers for a very extended period starting in late December. The yellow stamens add to the show, and the few hardy insect pollinators still around in the winter love them. 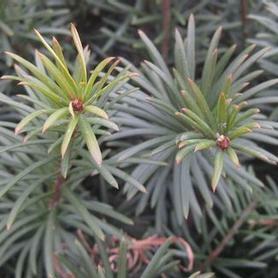 Best of all, the glossy evergreen foliage turns a stunning shade of purple all winter. Richard Hesselein has been working with this selection of Camellia japonica to produce a range of flower types that also display the winter foliage coloration and the cold tolerance. Camellia japonica 'Kumasaka' is a rosy pink peony form blooming in April and May. Evergreen and very cold tolerant. 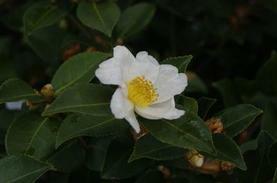 All Camellias are members of the Tea family. 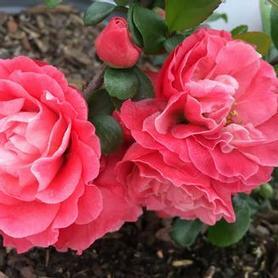 Camellia x 'April Blush' has semi-double blush pink flowers in April and May. An introduction from Dr. Clifford Parks, 'April Blush' is an evergreen spring blooming Camellia. 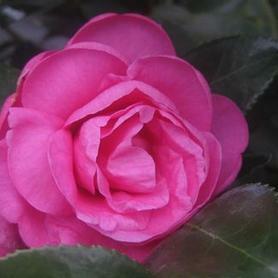 'April Pink' Camellia has large double shell pink flowers with a very formal, perfect appearance. It is a Dr. Clifford Parks introduction, and one that is new to us. It is spring blooming and evergreen. 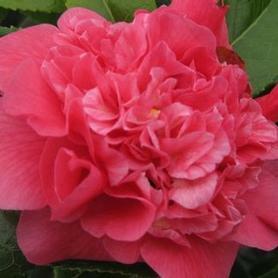 Camellia x 'April Rose' has double rosy pink formal flowers and blooms in April and May. 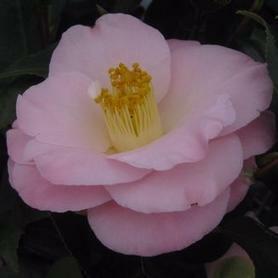 'April Rose' Camellia is an introduction from Dr. Clifford Parks and is evergreen. PRN Preferred: Large perfect double flowers. 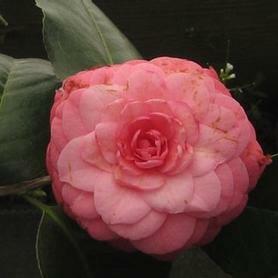 Camellia x 'Long Island Pink' has single pink flowers that bloom in the fall and a nice compact habit. 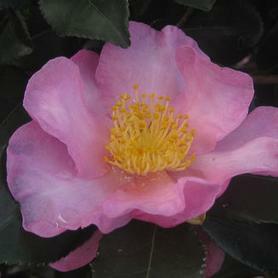 'Long Island Pink' Camellia was found on Long Island, NY and is evergreen. PRN Preferred: A compact neat form, very cold tolerant. 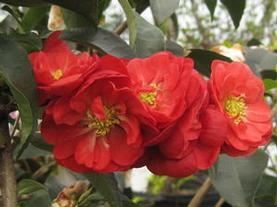 'Northern Exposure' Camellia blooms for an extended period in late fall and early winter. The pale pink flower buds open to large white blooms set off by bright yellow stamens. 'Northern Exposure' always sets multiple buds, and since they open progressively over several months, the flower display is a very showy addition to the late fall garden. Like all Camellias, 'Northern Exposure' has lustrous green evergreen leaves and prefers shade and protection from winter winds. Camellia x 'Spring's Promise' has single reddish salmon flowers in spring, with some blooms opening consistently in the fall. It has glossy evergreen foliage. PRN Preferred: Blooms in both spring and fall. 'Survivor' Camellia blooms in early fall, with large single white fragrant flowers that start out tipped by soft pink on the ends of the petals. It is evergreen and upright in habit. Its name indicates its excellent cold hardiness, and it results from a C. sasanqua and C. oleifera cross made by Dr. Clifford Parks. PRN Preferred: A very cold hardy, reliable bloomer. 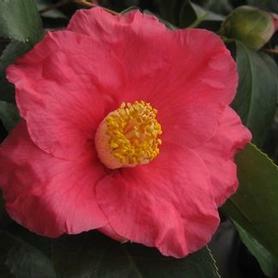 Camellia x 'Winter's Joy' has a semi-double fuchsia pink flower on a narrow upright form. Makes a good hedge in shady locations. From Dr. William Ackerman, Camellia x 'Winter's Joy' is fall blooming and evergreen. 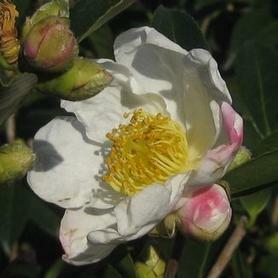 The flowers of 'Winter's Snowman' Camellia are a white, semi-double anemone-form. 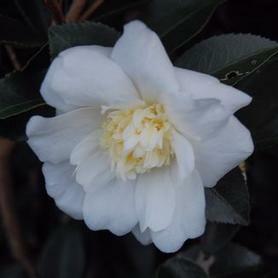 From Dr. William Ackerman, Camellia x 'Winter's Snowman' is fall blooming and evergreen with a narrow upright habit. 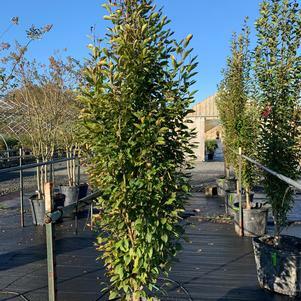 Fastigate European Hornbeam is an excellent tree for urban or formal sites because of its tight, extremely regular form and excellent disease resistance. When young, Carpinus betulus 'Fastigiata' is narrow and very upright, but it broadens into a dense tight pyramidal oval as it matures. 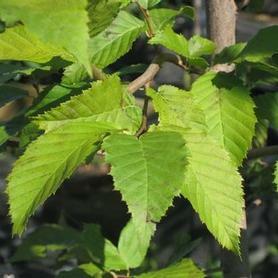 The leaves are neat and relatively small, and since the form never needs pruning, Carpinus is a maintenance-free tree. Even without foliage, the dense branching makes this an excellent screening tree in winter. 'Frans Fontaine' European Hornbeam is more columnar than Carpinus betulus 'Fastigiata', but is equally resilient in urban and suburban conditions. The narrower habit makes Carpinus 'Frans Fontaine' a good candidate for narrower spaces or street tree applications. 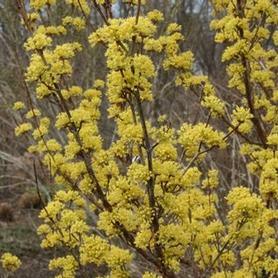 The fall color of the tidy foliage is a clear yellow, and winter interest is provided by the upright, densely branched form. Since all Carpinus varieties are a fall digging hazard, container production makes the planting season much longer. American Hornbeam is a tough, beautiful native tree which performs well in a wide variety of site conditions. Its green veined leaves and habit look somewhat like American Beech trees, and its interesting 2" hanging winged seed bracts add to its appeal in summer. It performs very well when transplanted from containers, and can be used in full sun or shade locations as well as sites which are periodically flooded. The fall color is attractive, varying from yellow through orange to reddish purple hues. It can be pruned to make a good tight hedge, like its European cousin, C. betulus. Ball O' Fire™ ('J.N. 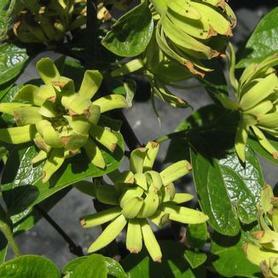 Globe') Musclewood has a tight round shape, with clean green summer foliage that turns a vivid orange, bronze and red in the fall. Found in the wild in Wisconsin, Ball O' Fire™ American Hornbeam was named and introduced by Michael Yanney of Johnson's Nursery. The color is more reliable when grown in cooler climates, and the compact size makes this tough, versatile native useful for smaller sites. The hanging winged fruits also add to Carpinus Ball O' Fire™'s appeal. Beyond Midnight™ Bluebeard ('CT-9-12') produces abundant deep cobalt blue flowers in late summer to early fall. The foliage is lustrous and disease resistant, growing on a compact habit. Caryopteris Proven Winners® Color Choice® Beyond Midnight™ need excellent drainage to thrive, and should not be cut back until spring. The foliage has an attractive minty fragrance, which may be why deer and rabbits leave it alone. A good plant for full sun containers. 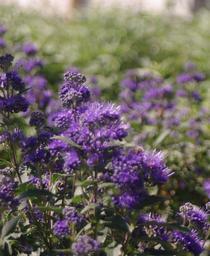 PRN Preferred: The flower color is the deepest blue of any Caryopteris we grow, and the habit is neat and tight. 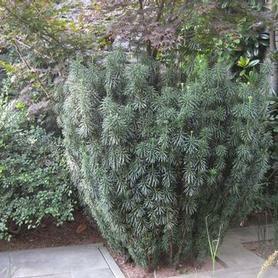 'Longwood Blue' Bluebeard has bluish violet flowers and grayish green aromatic foliage. 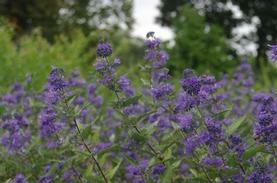 'Longwood Blue' blooms later than other Caryopteris, in mid to late summer. Dry site tolerant. 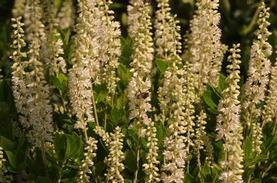 New Jersey Tea is a tough, adaptable native shrub with pretty white fluffy lilac-shaped flowers in June and July. The flowers have a lovely delicate fragrance. The fruits of Ceanothus americanus are subtle but interesting 3-sided capsules and the seeds are consumed by turkeys and quail. It does very well in seashore settings and dry sites. The name New Jersey Tea was coined during the American Revolution because its leaves were used as a substitute for imported tea. PRN Preferred: An adaptable native with showy fragrant flowers in summer. Sugar Shack® ('SMCOSS') Buttonbush is a more compact version of our interesting native Cephalanthus. The white puffball flowers appear in mid to late summer, attracting butterflies and other pollinators. The blooms are followed by red mace shaped fruit and burgundy foliage in the fall, providing food for wildlife as well as visual interest. Cephalanthus is very wet site tolerant (we first saw it while canoeing as little children), so it is an excellent bog, bioswale or rain garden shrub. 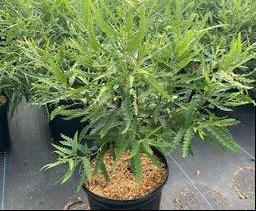 Cephalotaxus harringtonia 'Duke Gardens' has dark evergreen foliage and a tight, compact form. 'Duke Gardens' Plum Yew is excellent in shade but will tolerate sun as well. Originally found at The Sarah P. Duke Gardens in North Carolina, as a branch sport of C. 'Fastigiata'. 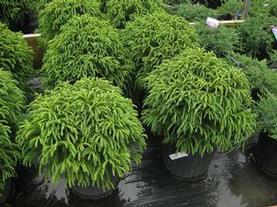 Cephalotaxus harringtonia 'Fastigiata' has evergreen foliage and a wide columnar habit. It makes a good pillar-like conifer for foundation and formal plantings. 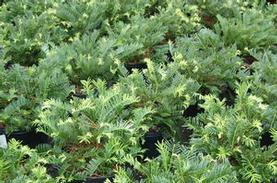 Fastigiate Plum Yew is a slow growing alternative to upright Taxus in deer country. Cephalotaxus harringtonia 'Prostrata' has dark evergreen foliage and looks like Taxus baccata 'Repandens' on steroids. Prostrate Plum Yew loves shady, dry locations. Best substitute for low growing Taxus in deer situations. 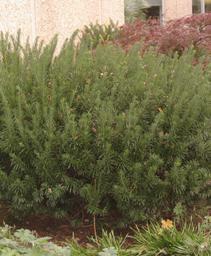 Drupacea Plum Yew is a broad, vase-shaped evergreen with coarse, dark green needles, like an enormous Taxus. Slow growing but eventually large, Cephalotaxus is a perfect solution to screening needs in deer country. 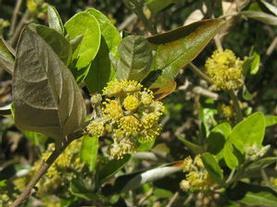 A dioecious species, the female plants, when pollinated produce walnut-sized, fleshy fruits. Per Bruce Crawford of The Rutgers Gardens, drupacea is the most winter hardy of them all. Cercis canadensis is a classic harbinger of spring, with pinkish lavender pea-shaped flowers covering its branches in April. 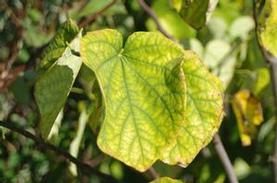 The green heart-shaped leaves of this Eastern Redbud turn yellow in the fall, and the zigzag branching habit in the winter adds to the appeal of this large shrub or small tree. 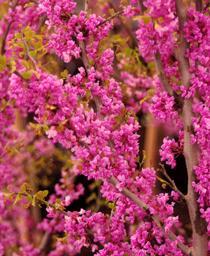 'Ace of Hearts' Eastern Redbud is a long-awaited dwarf form of Cercis canadensis with magenta pink flowers in April and May. It was found by Paul Woody of North Carolina. 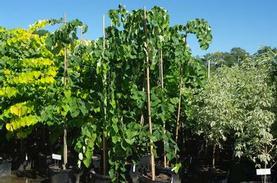 'Alley Cat' Eastern Redbud has foliage liberally splashed with white, and its striking variegation is stable and scorch resistant. The dark pink pea-shaped flowers emerge in April just before the leaves begin to show in shades of copper pink and soft green. As the foliage matures, the white emerges and makes a lovely contrast to the green. Alan Bush found Cercis 'Alley Cat' in an alley near his home in Kentucky, and gave it to Harald Neubauer of Hidden Hollow Nursery to introduce. PRN Preferred: The best and most reliable variegation in Redbuds. 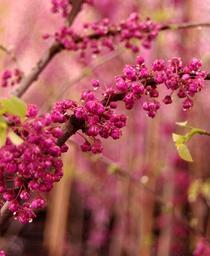 'Appalachia' Red Eastern Redbud has deep reddish purple buds that open to bright neon pink flowers in April and May. 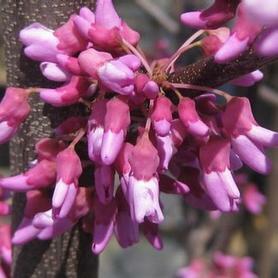 Cercis canadensis 'Appalachia' was found by Dr. Max Byrkit in Maryland. 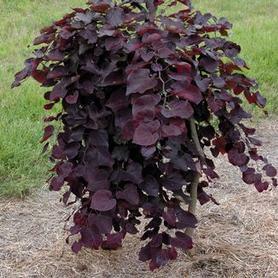 Burgundy Hearts® ('Greswan') Eastern Redbud is a refinement of the 'Forest Pansy' theme, with pinkish lavender April flowers followed by reddish purple lustrous foliage. 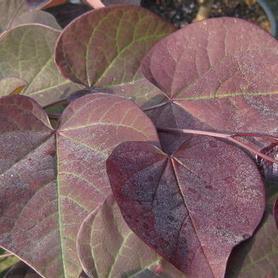 The heart-shaped leaves hold their dark color longer in the summer, taking on reddish wine tones towards the fall. Introduced by Greenleaf Nurseries. 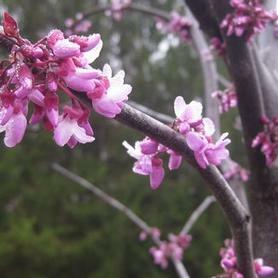 'Forest Pansy' Eastern Redbud has rose purple flowers and reddish purple foliage in April and May changing to bronze by fall. The foliage is strikingly beautiful in spring and early summer. 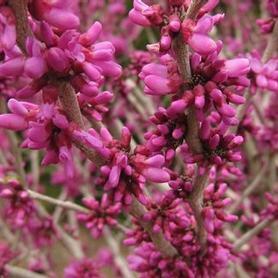 Lavender Twist™ ('Covey') Eastern Redbud has purplish rose flowers in April and May on an umbrella-shaped crown. Lavender Twist™ is a great introduction from Tim Brotsman, found by him in New York State in the garden of Mrs. Covey. 'Royal White' Eastern Redbud is a classic white flowering Cercis which was selected by the late great Dr. JC McDaniel of the University of Illinois. He chose it for the large, plentiful pea-shaped flowers produced abundantly in April. Since the parent tree was found in Bluffs, Illinois, the cold tolerance is excellent. 'Royal White' is vigorous and faster growing than other white forms, and we're glad to be able to keep this tried-and-true selection in circulation. 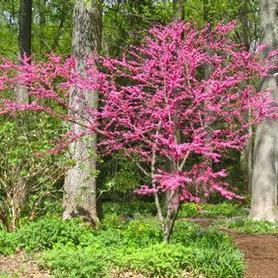 'Ruby Falls' Redbud is a weeping form of 'Forest Pansy', long awaited by avid plantsmen and brought to us by Dr. Dennis Werner of NCSU. The velvety purple foliage is displayed on graceful weeping branches, making a spectacular show in spring and early summer before it ages to greenish bronze. Its rosy purple flowers emerge before the leaves unfold. The name was chosen by 5 year old Porter Neubauer of Tennessee, undoubtedly a great future nurseryman. The Rising Sun™ ('JN2') Redbud is one of the most stunning plants we have ever seen, with foliage that starts as peachy apricot, maturing through chartreuse-yellow to a final deep green. Since all three color phases are present at the same time in late spring and summer, the effect is spectacular. 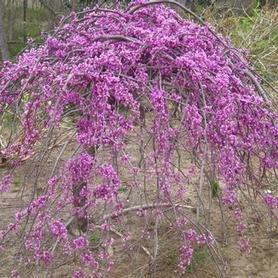 The blooms are the classic Redbud lavender in April and May. It was found and introduced by Ray Jackson of Belvidere, Tennessee. ‘Vanilla Twist’ Eastern Redbud is a cross between C. ‘Royal White’ and C. ‘Covey’, resulting in a weeping, white flowered Cercis. ‘Vanilla Twist’ combines the cold hardiness of one parent with the floriferousness of the other, and is stunning in April and May when covered with the white pea-shaped flowers. This exciting color breakthrough comes from the hard work and dedication of Tim Brotzman of Madison, Ohio (The introducer of C. ‘Covey’). 'Whitewater' ('NC2007-8') Redbud combines a more vivid form of variegation with a broadly weeping habit. The pea-shaped flowers in April and May are a deep rose-purple, displayed on the bare branches. 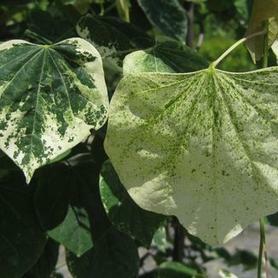 They are quickly followed by the heart-shaped leaves which emerge mostly white with green flecks, and mature to mostly green with white flecks. 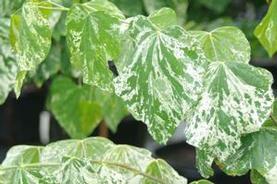 The weeping habit is an exciting addition to the bright variegated foliage. An unusual cross of 'Silver Cloud' and 'Covey' by Dr. Dennis Werner of NC State. Cercis chinensis 'Don Egolf' has branches that are absolutely covered with pinkish lavender flowers in April, followed by heart-shaped neat glossy foliage. It does not bear seed pods as much as other cultivars. 'Don Egolf' Chinese Redbud is a wonderful plant named after one of the world's greatest plantsmen, Dr. Don Egolf, who is much missed in the plant world. 'Pink Pom Poms' Redbud is another beautiful introduction from the work of Dr Dennis Werner of NCSU and Alex Neubauer of Hidden Hollow Nursery. The double flowered Cercis c. 'Flame' was crossed with Cercis r. Oklahoma, resulting in much bigger, showier double dark pink to purple flowers. When in bloom in April and May, 'Pink Pom Poms' is absolutely breath taking, and the huge flower display is not followed by seedpods because the blooms are completely sterile. 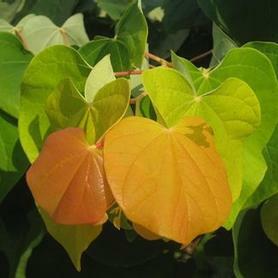 The green heart-shaped leaves appear after the blooms, and are glossy and attractive. The Double Take™ Floweringquince series comes from the work of Dr. Tom Ranney of NCSU's Mountain Research Station in Ashville, N.C. 'Orange Storm' has very large bright orange double flowers on compact thornless plants. The blooms appear in April for an extended period, with some sporadic reblooming in summer. Double Take™ 'Pink Storm' Floweringquince is another beauty from Dr. Tom Ranney, with very large double deep pink flowers in April. 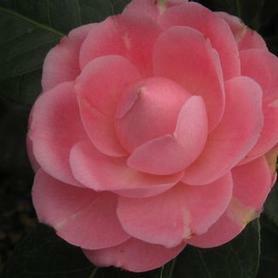 The blooms resemble Camellias in their size and color intensity. The compact plants are thornless, and their branches make lovely cut flowers to bring inside in early spring. Double Take™ 'Scarlet Storm' Floweringquince is the third release from Dr. Tom Ranney's team in Ashville, NC, with very large dark red double flowers. The thornless plants bloom for an extended time in April, sporadically reblooming in summer. 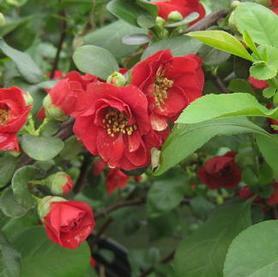 'Dragon's Blood' Floweringquince is a compact thornlessshrub with amazing flower power. The double blood red flowers are produced in great quantity all along last year's branches in April and May, persisting for a long time since they are primarily sterile. Chaenomeles 'Dragon's Blood' is not a particularly new cultivar but is very hard to find for some reason. Dr. Tom Ranney used it with great results as one parent in the crosses that produced his spectacular Double Take™ Series of Floweringquinces. 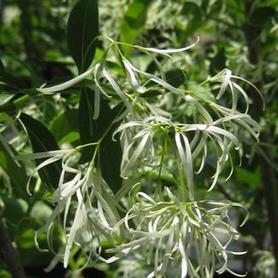 Chionanthus retusus 'Tokyo Tower' becomes covered with white panicles in May and June. This Chinese Fringetree is a shiny leaved fastigiate form, with beautiful tan and gold exfoliating bark. Harald Neubauer of Hidden Hollow Nursery in Tennessee brought it back from Japan, under the original name of 'Ivory Tower'. White Fringetree has intensely fragrant, fluffy white panicle flowers in May, followed by bird attracting bluish purple fruit if plant is female (dioecious). Although fruit only appears on the female plants, the flowers on the male plants are showier due to their longer petals. Fall color ranges from a yellowish green to to a bright golden yellow. Chionanthus virginicus is also wet site tolerant. 'Tom's Compact' Summersweet is the most compact we have seen of the Summersweets. This fragrant white flowered beauty was found and introduced by a great nurseryman of our area, Tom Dilatush. 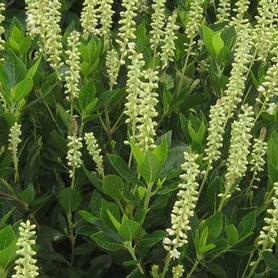 We've been waiting a long time to get our hands on Clethra alnifolia 'Compacta' and to top it off, it is wet site and salt tolerant. PRN Preferred: Compact dense habit, never needs pruning. Loved by pollinators. 'Hummingbird' Summersweet has very fragrant white flowers in June and July. This selection is a compact form that is both wet site and salt tolerant. 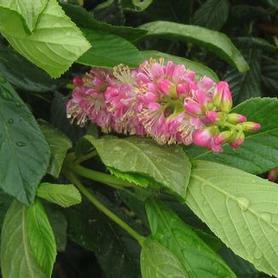 Clethra alnifolia 'Hummingbird' is an introduction from Calloway Gardens. 'Ruby Spice' Summersweet has very fragrant dark pink flowers in June and July. It is both wet site and salt tolerant. 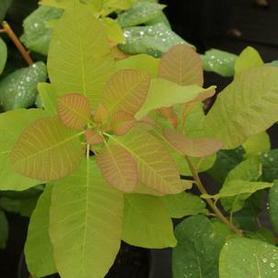 Clethra alnifolia 'Ruby Spice' was found by Andy Brand of Broken Arrow Nursery in Connecticut. 'Sherry Sue' Summersweet has very fragrant white flower spikes which are displayed on pinkish red new growth stems. 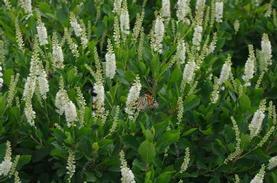 Clethra alnifolia 'Sherry Sue' blooms in July and August, providing nectar for a number of pollinators. It is found naturally in boggy areas throughout the Northeast, and is particularly useful because of its deer resistance and suckering habit. Introduced by the JC Raulston Arboretum in North Carolina. 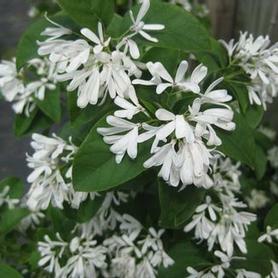 'Sixteen Candles' Summersweet has very fragrant white flowers in June and July. It is both wet site and salt tolerant. Clethra alnifolia 'Sixteen Candles' was introduced by Dr. Michael Dirr and has an improved upright growth habit and is compact in size. Sweetfern is a small but widely suckering shrub that energetically colonizes dry, acidic, sterile areas. 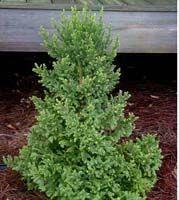 Foliage is green and fragrant (it's in the Bayberry family), with a fern-like texture. The semi-evergreen leaves turn bronzy green in the winter. 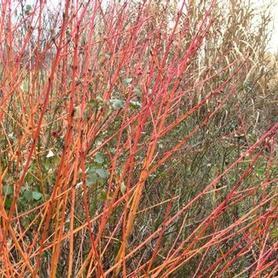 Baton Rouge™ ('Minbat') Tatarian Dogwood is particularly attractive in winter, when the young twigs become a showy scarlet. The clean green leaves in summer turn to an attractive dark red in the fall. The creamy flat-topped flower clumps appear in May and June, and are followed by interesting white berries in late summer. Baton Rouge™ Dogwood forms a large clump eventually because of its suckering habit. Prune back last year's twigs each winter, as the new growth is the most colorful. A sport of C. 'Elegantissima', Baton Rouge™ comes from Minier Nursery in France, by the way of Bailey's First Editions™ program. 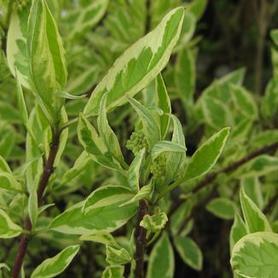 Ivory Halo™ ('Bailhalo') Tatarian Dogwood has brightly variegated leaves that emerge in spring with green centers surrounded by large ivory white margins. The flat topped creamy flowers in May and June are followed by white summer fruit. The fall color is pink and reddish purple, and the winter stem color is dark red and showy. Prune out older canes in the spring to maintain the winter stem show. 'Appalachian Spring' Flowering Dogwood has white flowers in April and May and good red fall foliage. 'Appalachian Spring' is resistant to Dogwood Anthracnose! Introduced by the University of Tennessee. Blooms heavily at a young age, but is a slow starter as a young tree. The parent plant was found in the wild in Maryland, where all the surrounding C. floridas were dead of Anthracnose. 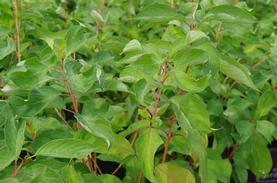 PRN Preferred: A more disease resistant native Dogwood cultivar. Cherokee Brave™ ('Comco No. 1') Flowering Dogwood blooms in mid to late spring, producing dark pink bracts with white centers. The leaves emerge in shades of burgundy in early spring and mature to green in summer. The fall color is attractive shades of maroon and red, accented by the bright red fall fruit, much prized by wildlife. Cornus florida Cherokee Brave™ shows good resistance to mildew, which is one of the reasons why Commercial Nurseries of Tennessee selected it. Cornus florida fruit is an important food source for migrating birds. 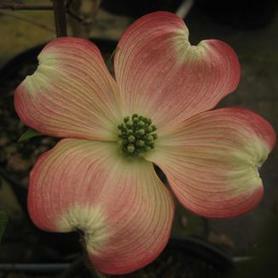 'Cherokee Chief' Flowering Dogwood has ruby red flowers and reddish new growth in April and May. 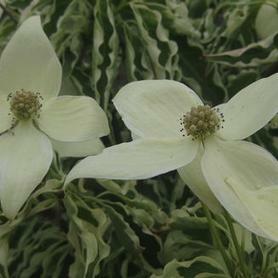 Cornus florida 'Cherokee Chief' has good resistance to Dogwood Anthracnose. Introduced by Hawkersmith Nursery in Tennessee. 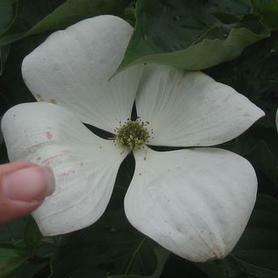 'Cherokee Princess' Flowering Dogwood is a vigorous disease resistant selection which has large white flowers followed by bright red bird-attracting fruit. The fall color is a good red, and plantsman Don Shadow says that it is his favorite classic white Dogwood because of its beauty and ease of growth. Introduced by J C Higden of Kentucky. 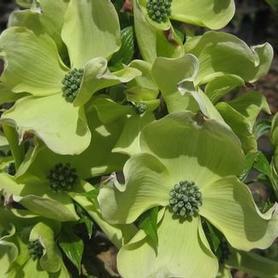 'Greensleeves' Kousa Dogwood has dark green leaves with prominent veins, and is a heavy flowering rapid grower, with excellent red fall color. 'Greensleeves' is a selection by Polly Wakefield of Milton, Mass. A very heavy fruiting Dogwood, and wildlife love the fruit, as do our Labrador Retrievers. PRN Preferred: A very heavy bloomer with excellent fall color and fruit. Our Production Manager, Daryl Kobesky's favorite Kousa Dogwood. Cornus kousa Samaritan® ('Samzam') is a wonderful introduction by Lake County Nursery of Ohio as one of their Biblical Series. Samaritan® has creamy white margins on the green leaves. Flowers in June are white bracts, but the striking variegated foliage is the eye catcher, especially when it turns pink, burgundy and red in the fall. The "Zam" refers to Jim Zampini. 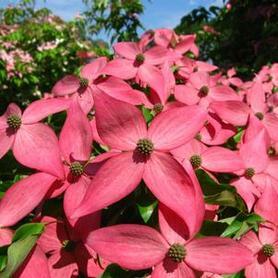 Scarlet Fire® ('Rutpink') Kousa Dogwood is a lovely new introduction from Dr Tom Molnar's work at Rutgers University. The bracts, appearing in June, are a dark strong pink which hold up well in our hot summer weather and often are showy for up to 8 weeks. 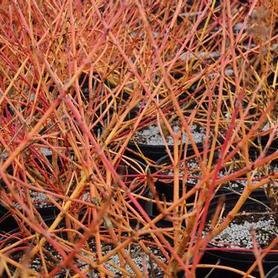 Cornus kousa Scarlet Fire® is a juvenile bloomer and vigorous grower, with clean disease resistant foliage. The classic red hanging fruit follows the flowers and the fall foliage color is also shades of red. This is the most pink, heaviest flowering Kousa Dogwood we know. PRN Preferred: Plentiful dark pink flowers, heavy bloomer at an early age. The best pink we have seen. 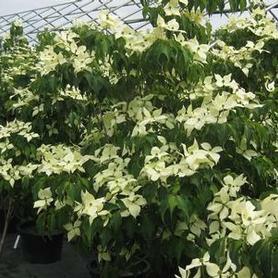 'Snow Tower' Korean Dogwood is an upright form of Cornus kousa, which makes it ideal for a tight space. 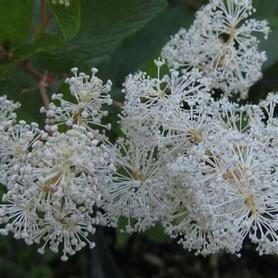 The large white flowers (bracts) emerge in late May and June, a little later than most Korean Dogwoods. The very showy flower display is followed by round red fruit in late summer which are very attractive to birds and mammals. 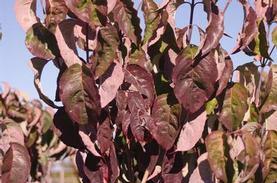 'Snow Tower' Dogwood has reddish purple fall color, and would make an excellent small street tree with several seasons of interest. Found by Gary Handy of Handy Nursery in Oregon. 'Wolf Eyes' Kousa Dogwood has white flowers in June and variegated white and green foliage with striking red and pink fall color. It is a Manor View Farms selection. It prefers a shady location. This is Richard Hesselein's favorite variegated Dogwood. Venus® ('KN30-8') Hybrid Dogwood has huge white sterile flowers in May and June, and is resistant to Dogwood Anthracnose and powdery mildew. Another winner from Dr. Elwin Orton (the Jersey Star® series). Its claim to fame is that Venus® has the largest, pure white flowers ever observed in the breeding program, reaching 6-8" across. 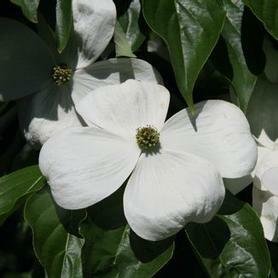 Venus® is also one of the latest blooming Dogwoods per Bruce Crawford. 'Kintoki' Japanese Cornel Dogwood has small brilliant yellow flowers in March, interesting multi-colored bark, and vivid red fruit in fall. 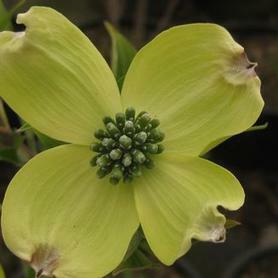 It blooms 2 weeks earlier than Cornus mas and was selected in Japan as an excellent cut flower plant. 'Kintoki' was introduced into the US by Barry Yinger through Brookside Gardens. PRN Preferred: Very showy early yellow blooms, exfoliating bark and brilliant fall color and bright red fruit, a true multi-season plant. 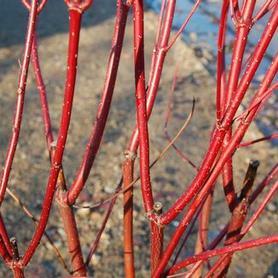 Cornus sanguinea Proven Winners® Color Choice® Arctic Sun™ ('Cato') is a variety of Bloodtwig Dogwood that has great winter interest because twigs are bright yellow at base flushing to blood red. Leaves are a good bright yellow in fall. From Andre van Nijnatten, who also brought us 'Winter Flame'. 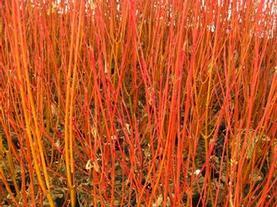 'Winter Flame' Bloodtwig Dogwood, also known as 'Winter Beauty', has yellow fall color which is followed by amazing winter twig color, yellow at base of plant flushing to reddish orange at outer edges. Looks like it is lit by fire all winter. Cut back old wood every year for best effect. From Andre van Nijnatten of the Netherlands. Cornus sericea 'Baileyi' has white flowers followed by bluish fruit. Excellent red fall foliage defoliates to expose reddish purple twigs for winter interest. 'Bailey' Redosier Dogwood is a Bailey Nurseries introduction. It is relatively salt tolerant. Cut the old wood back frequently to maintain the best winter color. The light green disease-resistant summer foliage of 'Cardinal' Redosier Dogwood is followed by vivid, cherry red stems in winter. Developed by Dr. Pellet and the Minnesota Landscape Arboretum, so you know it's tough. Most effective if the old wood is cut back yearly. It is relatively salt tolerant. 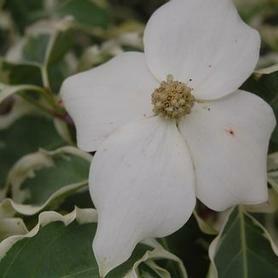 Celestial™ ('Rutdan') Hybrid Dogwood has profuse white flowers in May and is sterile. 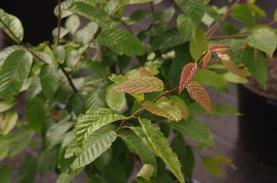 The reddish purple fall foliage and great disease resistance make it one of Dr. Elwin Orton's best introductions. 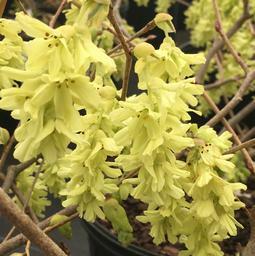 'Longwood Chimes' Fragrant Winterhazel produces 3" pendant clusters of soft yellow flowers in March and April. The blooms appear before the green foliage emerges, and are extremely fragrant as well as showy. Corylopsis glabrescens 'Longwood Chimes' becomes a large shrub with a broad habit. it was chosen for its excellent blooming characteristics by Longwood Gardens, from plants given to them by the US National Arboretum. Buttercup Winterhazel has delicate lemon yellow panicles in March and April. 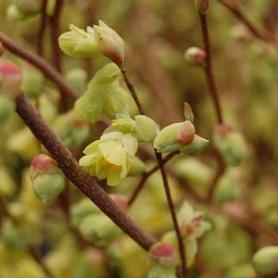 The habit of Corylopsis pauciflora is broad but delicate, with small, neat leaves. PRN Preferred: A smaller neater habit. Veitch Winterhazel is a showy, fragrant addition to the winter garden with primrose yellow, 2" pendant flowers set off by reddish anthers. 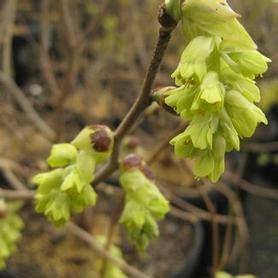 Corylopsis veitchiana blooms in March on bare branches and then produces foliage that starts out bronzy and turns to green, with glabrous undersides. 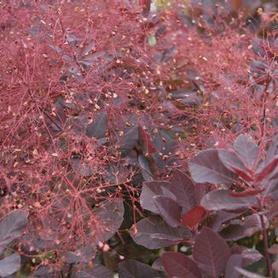 'Black Velvet' Smokebush produces extremely dark purple leaves in late spring which serve as a perfect setting for the pink smoke-like flowers in June. Cotinus 'Black Velvet' retains its deep foliage color better in the summer heat than most purple Smokebushes. Selected by S. Campbell of Sebastopol, California. 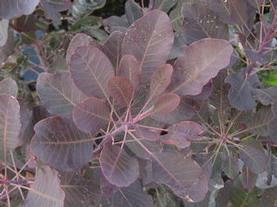 PRN Preferred: The deepest purple foliage we’ve seen for a Cotinus, more heat resistant color. 'Royal Purple' Smokebush has pink smoke-like flowers in June and July which are highlighted by brilliant purple leaves, which turn a reddish purple in fall. 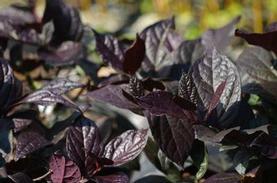 Winecraft Black® Smokebush ('NCCO1') produces deep purple velvety leaves in spring which are topped by dark pink smoke-like inflorescences in June. The contrast between the flowers and foliage is striking. After blooming, Cotinus Winecraft Black® does not fade as many other purple leaf plants do, retaining its dark purple color until fall, when the leaves turn beautiful shades of yellow, orange and red. All Cotinus benefit from a periodic pruning to promote new growth. American Smoketree bluish to dark green leaves and unique greenish smoke-like flowers in July. The fall color is spectacular, with shades of yellow, red and purple hues. The bark is also a beautiful gray and mature trunks become scaly for additional winter interst. Cotinus obovatus makes a very large shrub or an attractive small tree. PRN Preferred: As noted by Dr. Dirr "may be the best of the all American shrub/trees for intensity of (fall) color." and we agree. 'Grace' Smoketree has pink flowers in June and July with bronze new foliage which turns to purple. 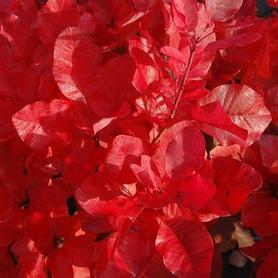 Cotinus x 'Grace' has luminous reddish purple fall foliage. From Peter Dummer, formerly at Hillier Nurseries in England. 'Winter King' Green Hawthorn has white flowers in late spring, brilliant orange fruit well into the winter, and silver bark. 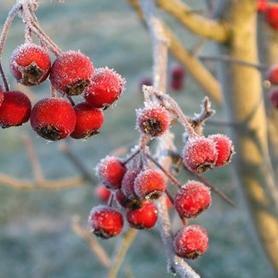 Crataegus viridis 'Winter King' is one of our favorite multi-season small trees. It is also salt tolerant. Alabama Croton is a very rare semi-evergreen native from the South, which has proved to be surprisingly hardy in zone 6. The light green leathery leaves have striking silver undersides in the summer, and the more mature foliage turns a lovely orange color in the fall. Croton alabamense prefers moist locations in semi-shade, and since it is a member of the Euphorb family, it is consistently deer resistant. The habit is loose and somewhat sprawling, so mix it in with other shrubs. Our first plant came from the generous hands of Rick Lewandowski, followed by a collection of plants from Fred Spicer of the Birmingham Botanic Gardens. The blackish green evergreen foliage of 'Black Dragon' Japanese Cedar has an interesting irregular texture on an upright plant. Cryptomeria japonica 'Black Dragon' is much slower and smaller than C. 'Yoshino', so excellent for smaller spaces. It is also salt tolerant. Dwarf Globe Japanese Cedar is a dense rounded evergreen which adds a lot of color to the year-round landscape. The tight needles are a vivid bright green in the summer. In the fall and winter, they turn bluish purple with shades of rust. Since it is both pest resistant and compact, 'Globosa Nana' works well as a foundation evergreen, especially where deer are a problem. Pruning will probably never be needed to keep its neat habit. 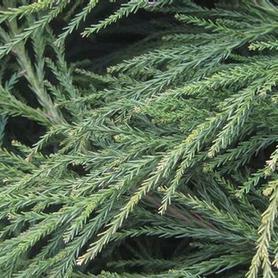 'Radicans' Japanese Cedar is very similar to Cryptomeria 'Yoshino' in texture, habit and hardiness, but its habit is tighter and darker green, with more resistance to winter leader problems. A very useful and rewarding conifer, one that Doug Webber of Blue Sterling and John Stella both prefer to 'Yoshino'. It is also salt tolerant.